The hearing aids we offer at bloom hearing specialists do much more than amplify sound. The aid’s sophisticated circuitry is programmed by our hearing care professional to suit your unique hearing loss, and the high-tech features are selected based on your lifestyle. We at bloom hearing specialists offer all modern hearing aid styles. Book a free appointment with our Audiologist at your local bloom hearing specialists store to find out more. As well, you can contact us at 1800 554 968. You can book an appointment with our Audiologist or call us at 1800 554 968 and discuss the degree of your hearing loss with us. How do I turn my hearing aid on & off? Is it OK to sleep in my hearing aids? When going to bed for the night, you should remove your hearing aids and open the battery door to help conserve battery life. Can I wear hearing aids when taking a shower, bath, or swimming? Even with the water resistance capabilities of modern hearing aids, we recommend you remove your hearing aids prior to any aquatic activity. What does the button on hearing aid do? If there is a button on the hearing aid, it is there to select between different listening programs or environments. My hearing aid is beeping continuously, what does that mean? How to differentiate the right hearing aid from the left hearing aid? What is the white thing at the end of hearing aid that goes into my ear? What is the hole next to the wax filter on hearing aid? Natural ventilation is important because it prevents the 'plugged up' or occluded sensation you would get if your ear was completely closed off with the hearing aid. What is the clear antennae things on my hearing aid? My custom hearing aid has a volume control. Which way should I turn it to change the volume? Rotate the volume control wheel forward/towards your face (when wearing the hearing aid) to increase volume. Rotate the wheel backwards/away from your face to decrease volume. What should I do when my hearing aid sounds quieter than usual / no sound? First check whether the volume control is working, and whether you can make it louder. To do this, take the hearing aid in your hand and clasp it. The hearing aid should now emit a whistling noise. Check the hearing tube and earpiece for earwax or moisture and clean if necessary. Check whether the battery is correctly inserted and fitted in correctly. If there is no improvement, replace the battery. If the problem persists, contact your local bloom hearing specialists store by calling 1800 554 968 or booking a free appointment online. What do I do if the battery discharges too quickly? Insert a new battery and take note of exactly how long it lasts. You can always contact our local bloom hearing specialists shop for information for help and advice. How long can I store the batteries? Do they discharge themselves at some point? This sticker keeps the battery close to airtight. As soon as you remove this sticker, the zinc/air battery is activated by drawing in oxygen through tiny holes. Therefore, you should not remove the sticker until you need the battery. It is recommended that you remove the sticker from the battery, and wait about 2 minutes, before you insert the battery. If you need immediate assistance, you can call us at 1800 554 968. What should I do if I hear crackling or buzzing noises? Check the hearing tube and earpiece for earwax or moisture. Check the hearing tube for damage (colour changes, hardening, or cracks) and replace it if necessary. If the problem persists, contact your local bloom hearing specialists store for assistance by booking a free appointment online or calling 1800 554 968. What should I do if my hearing aid whistles? What should I do if I experience pain or inflammation in my ears? Remove the hearing aid and contact your local bloom hearing specialists audiologist. If the problem persists, please contact your doctor. If you are experiencing feedback, try cleaning your hearing aids and your ears themselves. If that does not stop the feedback, consult your local bloom hearing consultant. You can book a free appointment online with your local bloom hearing specialists store or call 1800 554 968, where we can assist you on finding the right hearing aids for you. My ear gets hot & damp when I am wearing my hearing aid, what can I do about it? Refer to the User Guide that came with your hearing aid for more details. Gently clean your hearing aid with a soft, dry towel. Alcohol, solvents or cleaning products cause damage. If you need immediate assistance, you can call us at 1800 554 968. Cleaning your hearing aids more frequently will help keep them in the best condition possible. Generally a good practice is cleaning them once every morning before you put them on. - Protect your hearing aid from moisture. Remove the hearing aid from your ear before showering, bathing or swimming. Due to high moisture levels, you should not leave it in the bathroom. Occasionally clean your ears before inserting the hearing aids. Moisture and condensation can damage the electronics in your hearing aid. We recommend that you remove the battery from the hearing aid at night and to leave the battery compartment open. You can use special drying systems that are available from your local bloom hearing specialists store. - Place the aid out of reach of children and pets. Hearing aids that are still switched on and lying around emit high pitched sounds that can irritate dogs. This has resulted in some aids getting eaten by pet dogs. It is best to dry the tube with a puff of air using an air puffer (do not blow air through the tube from your mouth). You can get this inexpensive accessory from your local bloom hearing specialists store. Zinc Air hearing aid batteries use air as an energy source, and the tab seals the air holes on the battery. Once the tab is removed, it takes approximately two minutes before the hearing aid battery is activated/charged. At that point, the battery compartment can be closed. If not the battery can in the worst case be damaged and will not come back to normal Voltage level needed! Please remember not to remove the tab before the hearing aid battery is to be used. Reattaching the tab will not prolong the running time of the battery. Optimal room storage temperature for storing hearing aid batteries is between 10 and 25°C. Heat may shorten the running time and a humid environment is not suitable for storage. Finally, avoid storing hearing aid batteries in the refrigerator. Contact with metal objects such as keys or coins can cause a hearing aid battery to short-circuit, therefore it is recommended to never carry individual batteries loose in a purse, wallet or handbag. Dented battery surface causes poor contact with battery terminal of the hearing aid. Battery is dead (even if it is brand new). This is very rare. Can as well happen when not activated correctly. Built up dirt on the battery terminal of the hearing aid causes poor contact. The battery does not fit into the battery door of the hearing aid (some battery doors are designed with a smaller cavity where the battery negative housing is placed). If the hearing aid does not work properly after replacing with a new battery (wait two minute after removing the tab before use), please take your hearing aid to your hearing care provider for further troubleshooting. Personal hearing habits have changed (longer period of use per day, higher noise level, new features of the hearing aid are being used). The hearing aid was in use longer than usual (e.g. night at the theater). The hearing aid is new, or the type or brand of the hearing aid has changed. The battery tab is removed and activation period as too short. It has to be 2 minutes or more before it is inserted into the hearing aid. The hearing aid is not switched off over night or after a long period of non-use. The battery loses capacity due to a short circuit when mishandled (e.g. through contact with metal objects). The battery is stored in a warm environment (e.g. in parked car in the sun). Normally non-customized hearing aids are fitted within one week and custom aids are fitted within two weeks of your hearing assessment. 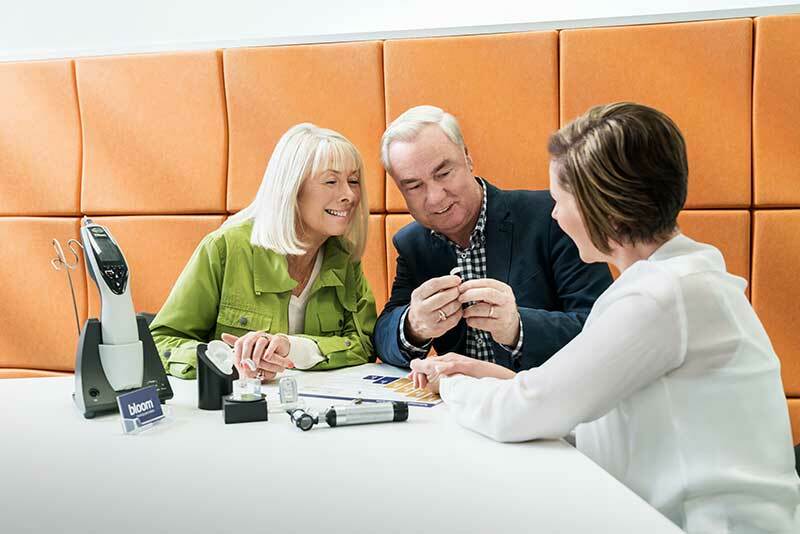 All our hearing aids are selected and programmed individually to meet your specific hearing requirements and this can take between one to two weeks dependent upon the type of hearing aids. If you want to learn more about the hearing aids we offer you call us at 1800 554 968 or book a free appointment online with your local bloom hearing specialists store. Yes. We, at bloom hearing specialists, offer a 30-day money-back guarantee, which is now the industry standard. But it is important to give yourself a reasonable chance to adjust to your hearing aid, knowing it often takes a few months to get comfortable. As well, there is a 2 year guarantee to all of our hearing aids. To learn more about our latest offers, call 1800 554 968 or book a free appointment online with your local bloom hearing specialists store. Yes. Most people need an adjustment period of up to four months before becoming acclimated to — and receiving the full benefit of — wearing their hearing aids. However, you should expect to notice obvious benefits during this trial period. Remember, your hearing professional is there to help. Do not be afraid to call us at 1800 554 968 or visit us by booking a free appointment online with your local bloom hearing specialists store to discuss your concerns. The adjustment period may be tiresome. It’s a lot like retraining a muscle that hasn’t been used in a while. But the benefits will be worth it after you’ve made the adjustment. The squealing, you or those around you hear is called feedback. This may happen because of some changes in the the way hearing aid fits in your ear. Cleaning the hearing aid, debris in the ear canal or your ears have grown (your ears continue to grow as you age) could be some of the reasons for this problem. Cleaning your hearing aids and the ears themselves can help reduce the effect of Feedback. If cleaning does not help, please consult your local bloom hearing consultant. You can book a free appointment online with your local bloom hearing specialists store or call 1800 554 968, where we can assist you in finding the right hearing aids for you. My ears get hot and damp when I am wearing my hearing aid, what can I do about it? A hearing aid prevents moist air from escaping the ears. Almost every hearing aid has a tiny hole that allows the air to pass through it. You can try our FREE Online Hearing Test. You can book a free appointment online with your local bloom hearing specialists store or call 1800 554 968, where we can assist you on finding the right hearing aids for you. No hearing aid can restore your hearing 100 percent. However, our hearing aids will let you hear soft sounds that you couldn’t hear before. Your hearing aids will also help you better understand speech, especially in noisy environments and prevent loud sounds from becoming uncomfortably loud for you. Although it is not possible to restore your natural hearing, hearing aids allow you to hear better. If you think a person close to you is having hearing loss, you should recommend him visiting a hearing specialist. We offer a FREE Online Hearing Test, which takes only 10 minutes. You can understand better how it sounds for people with hearing aids here. You can book a free appointment online with your local bloom hearing specialists store or call 1800 554 968, where we can assist you on finding the right hearing aids. You need to keep exercising your hearing to maintain good hearing. By using hearing aids you can actually minimize the level of hearing loss in comparison to not taking action. So despite of common believe, the use of hearing aids does help you exercise your hearing. If you are worried that you might have a hearing problem, can try our FREE Online Hearing Test. You can book a free appointment online with your local bloom hearing specialists store or call 1800 554 968, where we can assist you on finding the right hearing aids for you. Tinnitus is often described as ringing in the ears, buzzing or humming noises but it can be experienced differently from person to person. It can be very difficult to concentrate and can keep you from sleeping well at night leaving you exhausted during the day. Tinnitus is not a disease, but a non-specific symptom that can be brought on by a mental or physical ‘change’, not necessarily related to hearing in the ear or the auditory pathway. If you want to know more about our offers, you can book a free appointment online with your local bloom hearing specialists store or call 1800 554 968, where we can assist you on finding the right hearing aids for you.